InMail is by far the most powerful tool that the LinkedIn platform offers, and it indisputably justifies any of the premium subscriptions as a standalone feature. 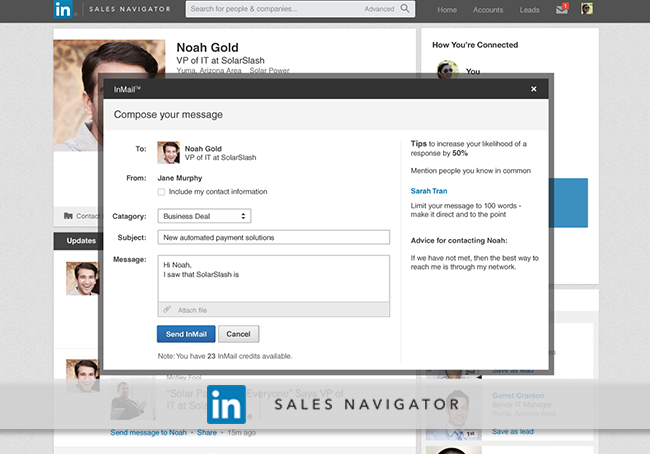 In the new era of social selling, InMail creates more opportunity for salespeople, recruiters and working professionals than anything the industry has seen before. That’s why it’s important to understand the strategies and tactics required to harness this tool for maximum effectiveness. We’ll start with the obvious: the content of your InMail is only as good as the title. This is where the “social” of social selling comes into play. Research your prospect to identify something personal that you can reference in the subject line to pique their interest. Maybe your prospect is using LinkedIn’s publishing platform? Start there. Maybe they’re active on Twitter? Or maybe it’s in the bottom of their LinkedIn profile, plain as day. 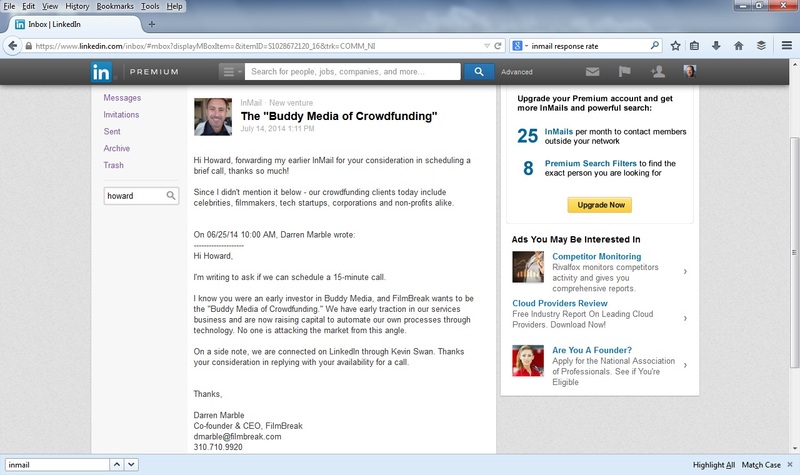 In the example below, my prospect VC was an early investor in Buddy Media, thus my title “The Buddy Media of Crowdfunding” was likely to capture his attention. If you’ve read my previous post, 4 Tips For Effective Social Selling, you know I feel strongly that the purpose of any social selling effort should be to set an appointment. That’s why I open 100% of my InMails with the following line: “I’m writing to ask if we can schedule a 15-minute call.” One of my mentors once told me, “Ask for exactly what you want, and you’ll likely get it.” By asking for the appointment up front, you quickly diffuse any uneasiness your prospect may have about your objective in contacting them. I should note that most articles suggest opening with a brief personal introduction. I disagree with this approach, and here’s why: When I receive messages on LinkedIn, the first question I’m asking myself isn’t “who is this is person,” but rather “what does this person want?” By proactively addressing your prospect’s most intuitive question, you effectively smoke out their most intuitive objection. To drive this point home, my response rate on a single InMail is about 5% (targeting C-level executives and VCs). On the 2nd InMail to the same prospect, my response rate is around 25%. Put another way, sending the same InMail twice increases my response rate by 500%. InMail is like the sword in the stone – only those who are worthy can use it. Now go sell something.